Interview by Lori Bizzoco. Written by Maria Darbenzio. Lisa Winning and Carrie Henderson McDermott, founders of HeTexted.com, are two women with different relationship statuses, but they both know the difficulties that come along with dating in the age of technology. 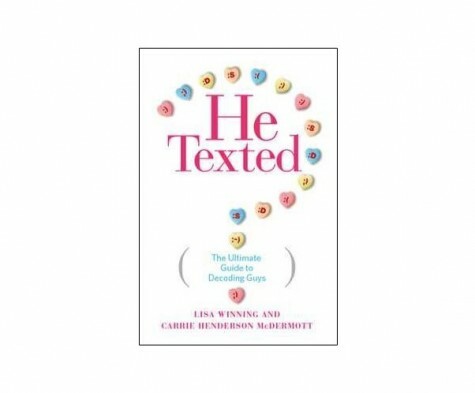 In their new book, He Texted: The Ultimate Guide to Decoding Guys, they help women through various situations and suggest how to handle guy problems. With how rapidly digital media continues to expand, this guide is a must-have for every girl’s bookshelf. What prompted you to create the site? Did you just want to help women? I remember when texting first came out, and there would be these crazy conversations with my girlfriends about what a certain text meant, how to interpret what a guy said, and what to say back to him. I can’t believe it’s still like that today — I figured this new generation of millennials would have texting all figured out by now. L: There’s still so much ambiguity. When something isn’t face-to-face, there are so many layers and so many different ways you can take it. And now things are even trickier with Facebook and whether you should add him as a friend or not, which is something we address in our book. It’s just an absolute minefield. I think that’s why so many people find dating quite confusing. It’s no longer just seeing a guy; it’s also social media and whether you should be following him on Twitter, etc. C: Every chapter takes a different situation where you’re not face-to-face with a guy and talks about how to handle it. Now, let’s talk about a few specific instances. First, we’ve all met that guy who refuses to call and only texts. What’s the best way to handle someone like that? Do you think a relationship can be built on texting alone? L: I think that texting is increasingly how everyone’s interacting. We get inquiries all of the time like, “This guy’s been texting me for three months now, and I still haven’t seen him” or “I met this guy on Tindr, and we’re chatting every day, but he hasn’t set up a date yet.” At the end of the day, you have to remember that nothing replaces face-to-face interactions. Obviously, spending time with someone is the basis of any sort of meaningful relationship. So if he’s not calling you and you’re not seeing him, then it’s just a distraction. It’s a form of entertainment rather than a real relationship. Say a guy goes out with his buddies and tends to drunk text his ex a lot. Is this a red flag for a relationship? C: We get this question a lot, and it’s a completely common situation. At the same time, if he gets drunk and the first thing he thinks to do is text his ex-girlfriend, that means absolutely nothing good for you. You don’t want to be in a relationship with someone who, when all his guards are down, is thinking of his ex instead of you. You want to run from that situation because you want to be with a guy who only thinks of you and wants to be with you always. You never want his ex-girlfriend in the back of his mind; that never ends well. We get a lot of ex-girlfriend questions too. Social media makes it easier to leave a trail. So you go to the Facebook page of your new boyfriend; you click his profile pictures; and his old ones are with his ex-girlfriend. And you’re like, “Oh, I don’t like that.” Or you see he’s tagged in a picture, and you click on her name on Facebook to see what her profile looks like. It’s human nature. Lastly, could each of you share your top tip for dating in the digital age? L: More than anything else, you still need to go with your gut instinct. I think we all spend too much time thinking about “Should I text him?” or “He Facebooked me two days ago. How long should I wait before responding?” It’s good to keep those things in mind, but nothing replaces that moment when you first meet someone or when you first do something really meaningful together. You recognize that the relationship has significance. So I think you need to go with that feeling. C: The biggest thing to me is open communication. There are so many different ways to talk now, and people aren’t always being honest. Direct communication and really sharing your true feelings instead of what you think you need to feel is most important. Check out HeTexted.com for more digital dating insights and to order a copy of the book!